Investing in students is one of the best parts of youth ministry, yet it comes with profound responsibility. As we connect with students, they start to feel like family. To be honest, some become family. After my husband and I got married, we were invited to Thanksgiving at the home of two of our students. Seven years later, we can still be found at their home on Thanksgiving. Do we go because of the delicious, free food? Yes, but that’s not the only reason. Those students and their parents are family to us. As youth leaders, it is our responsibility to know our students. So, when we observe changes in their moods and personalities, we take note. Red flags go up. Alarms sound. We know a change occurred, but what was it? How do we respond? In 2016, a mental health campaign started to help people know the Five Signs of Emotional Suffering. This campaign, called The Campaign to Change Direction, is a nationwide initiative to change how how mental health is perceived in the United States. New Hampshire is the first state to join the campaign. Its goal is to make the Five Signs of Emotional Suffering as well known and accepted as other health signs, such as the symptoms of a heart attack. They withdraw or isolate themselves from other people. Someone who used to be socially engaged may pull away from family and friends and stop taking part in activities he or she used to enjoy. In more severe cases, the person may start failing to make it to work or school. Not to be confused with the behavior of someone who is more introverted, this sign is marked by a change in someone’s typical sociability, as when someone pulls away from the social support he or she typically has. They seem overcome with hopelessness and overwhelmed by their circumstances. Have you noticed someone who used to be optimistic and now can’t find anything to be hopeful about? That person may be suffering from extreme or prolonged grief, or feelings of worthlessness or guilt. People in this situation may say that the world would be better off without them, suggesting suicidal thinking. In 2006, I became a youth leader at my church’s youth group. I was 23 years old. At the time, I thought volunteering in youth ministry meant building relationships and sharing God with students–nothing more, nothing less. I never thought being a youth leader meant I could be one of the first people to recognize signs of emotional suffering in a student’s life. Over the years, I learned that God can use me, along with other youth workers, to support students with getting the help they need in various areas of their lives, including their mental health. Our youth groups are filled with students who show signs of emotional suffering. 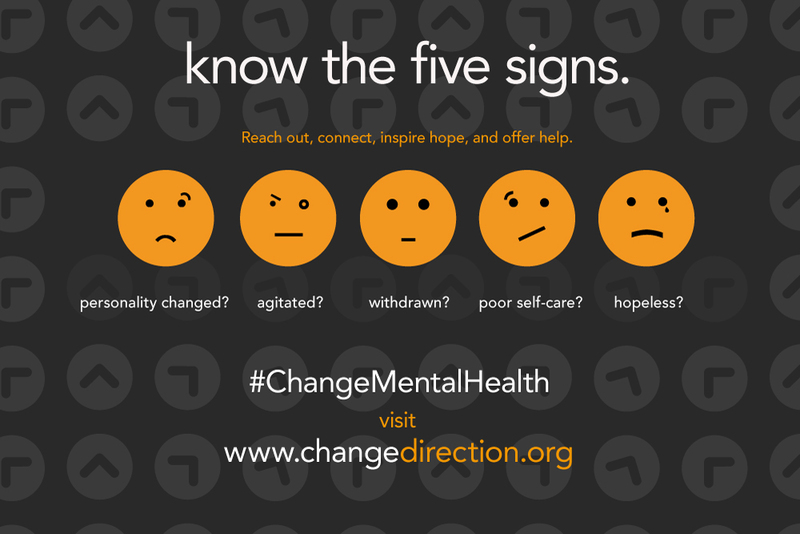 Keeping these five signs in our mind as we work with students, could help change or even save a life. If students exhibit any of these signs, talk to them. Talk to their parents. Provide resources, as needed, to link students and their families to professionals who can take a closer look at the signs they are exhibiting. Taking action can mean the difference between a student feeling alone in their struggle or feeling supported and loved by God’s people. It’s time for us to change the culture of mental illness in the United States and in our youth groups. Let’s start by bringing these five signs back to our youth groups to share them with our leaders and students. For more information, go to http://www.changedirection.org. Yvette Cullum has worked in the mental health field for 6 years and has volunteered in youth ministry for 11 years. She currently resides in Salem, New Hampshire with her husband, works at a community mental health center, and serves in her husband’s youth ministry.